Small rhymes such as “Brush, brush, brush your teeth, brush them everyday” (to the tune of “Row, Row, Row Your Boat”) spread happy mood while brushing. Sing the song together with your kids and start brushing. Remember, fun and catchy tunes since you won’t really be singing, with a toothbrush in your mouth. Another good way to motivate you child to brush its teeth is to show it a video while brushing. 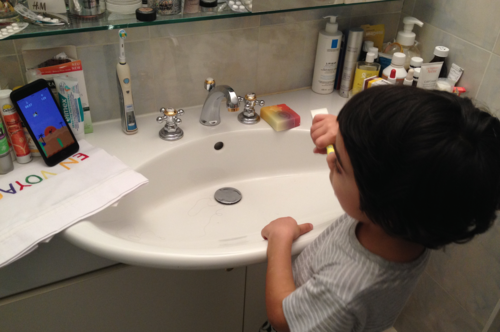 While brushing, the video will entertain your child and draw off its attention from brushing. Before bringing your kid to bed, a small story about the tooth family might be a good way to make brushing fun. The tooth family only sleeps well, if it is brushed correctly and all the teeth are clean. However, if the members of the tooth family are not brushed at all, they become sad and start fighting with each other. Hopefully your child will take this as a motivation to start brushing its teeth voluntarily the next day. Did you ever perform a toothbrushing dance? Turn on the favorite music of your kids and let them start brushing. If you realize that they are not brushing correctly, turn off the music and wait until they continue to brush. Last but not least and possibly the best way to convince your children to brush their teeth not only regularly but also correctly is to use PLAYBRUSH. By connecting the smart gadget with your children’s’ toothbrush, your kids will be able to play fun and instructional games on the smartphone. In fact, this is the best way for you to get rid of the daily brushing-struggle. In conclusion, there are several methods to teach children to have fun while brushing their teeth. However, you should try all (or at least some) of the above-mentioned techniques by yourself and see, what really works for your child. Based on our experience, we know what children like and what motivates them to brush their teeth and it is called PLAYBRUSH.